Most of us who are passionate about our sport teams have that one team that they cannot stand. With that animosity for that team comes a playful disdain for that’s specific teams fan base. Dolphins and Jets fans can’t seem to get along. Ohio State and Michigan fans find it hard to get along. Yankees and Red Sox fans have been trading verbal jabs for decades. But aside from the playful competition there is a hint of humanity and an understanding (most times) that while they may bleed their teams colors, at the end of the day it is simply a sport, a game. I happen to enjoy the passion and the excitement that New Orleans Saints fans, or more appropriately deemed “Who Dat Nation”, bring to every single game. I particularly enjoyed watching them revel in the Saints’ Super Bowl win a few years ago. The long suffering franchise finally tasted sweet victory. A city riddled from the effects of Hurricane Katrina needed something positive to cling to. The Saints provided it. And regardless of your loyalties I doubt there were many people who did not at least tip your hat and smile when the Saints did hoist the Lombardi Trophy. You would have had to have been living under a rock to miss everything going on in the NFL in regards to the Saints and the Bounty system they had in place. NFL Commissioner Roger Goodell came down hard on the Saints with fines, loss of draft picks and lengthy suspensions. As we move day-to-day there will be new information pouring out regarding the Bounty system. Saints Coach Sean Payton will appeal his suspension (which he is entitled to do) and Goodell will eventually hand down suspensions to the players directly involved. One of the new bits of information is a released audio tape of a speech former Saints defensive coordinator Gregg Williams gave to his team before a game against the 49ers in January. In the speech, captured by filmmaker Sean Pamphilon, Williams urges Saints players to inflict harm on several 49ers, including quarterback Alex Smith, running back Frank Gore, as well as wide receivers Michael Crabtree and Kyle Williams. Pamphilon captured the footage while working on a film about former Saints special teams player Steve Gleason, who suffers from Amyotrophic lateral sclerosis. After listening to the audio, it’s clear that the Saints and more accurately Gregg Williams were handed a punishment that fit the crime. However, do not ask the members of “Who Dat” Nation. Saints fans are now creating Facebook Fan Pages, Petitions and are even distributing t-shirts and bumper stickers. One of the movements it’s called “Occupy Who Dat”. Humorous as it may be it shows a clear disconnect between “fandom” and “humanity”. Debating an opposing point of view is met with swift and at-times rude responses from fans. Fans who believe the penalties handed down by the commissioner were “unfair”, fans who believe the Saints were singled out, fans who want Goodell’s head (no pun intended). But all the rhetoric begs the question, have fans lost touch with reality? Humanity? When do we stop looking at this as fans and start seeing the human element of this whole thing? What are their definitions of fair and unfair? Saints fans believe Coach Payton has been treated unfairly, but would Payton still be a victim of an injustice had evidence come out that a player was severely injured or even crippled? 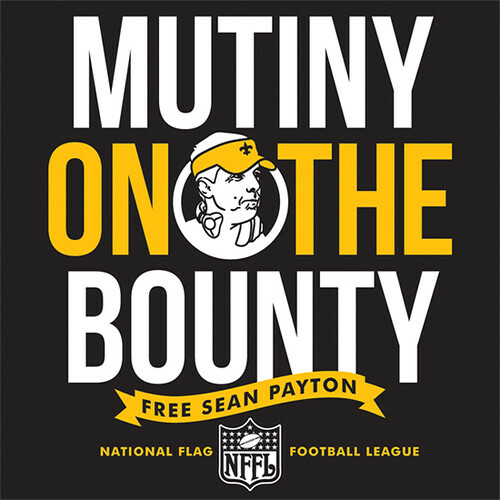 Who would be embroidering shirts with the battle cry “Free Sean Payton”? Better yet, who would be wearing shirts depicting the debilitating injuries that the bounties contributed to? At this point in time there aren’t any cases (that are public) that truly illustrate the impact that the bounties had, but just because there isn’t any public evidence does that mean it takes away from the importance of this matter? The reality that Saints fans cannot grasp is that not only did the Saints do something that the leagues deemed illegal, the Saints ignored several attempts from the NFL, Roger Goodell and even Saints owner Mickey Loomis to put a stop to it. It has been documented that Coach Sean Payton was told more than once to stop it and he either completely ignored the request or lied by currently covering it up. But according to Saints fans, Payton is the victim of an injustice. Forget that Payton and the other Saints’ involved showed arrogance, dishonesty and a total disregard for the integrity of the game. Forget how audacious it is. Forget that it was Saints like Payton and Williams who put the Saints in this situation, not Roger Goodell, not the NFL. The truth of the matter is Payton didn’t lose his job. He is still a millionaire who, once his suspension is up, gets to return to his job and continue to make millions of dollars. In fact, Payton has a gig already setting up for him. No unemployment line. No forced career change. 365 days from now Sean Payton will be back in the fold and making millions. I am not saying the punishment is too much or too little. I am not questioning the character of Sean Payton, nor the person who he is. From everything I have seen and read about Payton he is one of the best coaches in the NFL. My point is merely to question when do we accept that these people who were revere so much are capable of huge mistakes? Several years ago when the New England Patriots were caught in what is now infamously referred to as “Spygate”, there wasn’t a huge movement on Facebook to “free the Pats”. Fans didn’t rally with petitions. T-shirts and bumper stickers didn’t cry for justice. You do the crime you do the time. It’s time to see this for what is truly is. It’s time to accept that a precedence for these bounty systems needed to be set. It’s time to realize that regardless of how football “used to be back in the day” or how “soft” it has seemed to become (in many fans’ eyes) that the Saints did something wrong. Payton and Williams participated in the crime, had hands in running it and directly ignored demands to stop it both from the league and their own employer. That in of itself deserves consequence. Saints fans deserved better than this. The face the fan base is rallying behind the penalized coaches in this manner speaks volumes about their loyalty and dedication. But keep in mind that this isn’t just a direct violation of the NFL, it’s rules and the other teams, it’s a violation of you fans. In the end, it’s you who suffer the most because of these actions. Remember that when you put on your “Free Payton” t-shirts. Will the Colts Get Luck-y?